I’ve been thinking a lot about what I wanted to write for the blog over the past few weeks and I kept circling back to this video I watched during a particularly hard week, it was sent to me by my friend Jessica Coulter @coultergirl it’s a discussion between Michelle Obama and Oprah at the Next Generation of Woman. I paused the video at this point to let those words marinate, she had so eloquently and simply described what I believe in my heart to be true. Over the past 4 years I have thrown myself into a practice of getting closer to myself, learning about who I am in my true essence. It was born out of a desire to explore something beyond my career or my relationship at the time. So as a childless twenty-something I would cram hours of study on spiritual development, mindfulness, theology, and psychology so I could become my own best friend and start to cultivate an authentic understanding of who I was. This process was long and painful at times, sometimes I didn’t want to look in to the vulnerable places out of fear but it was always in this discomfort that the magic was found. It was in these moments that a deeper understanding of myself was born. These challenges suddenly had a different look, they were a gift. 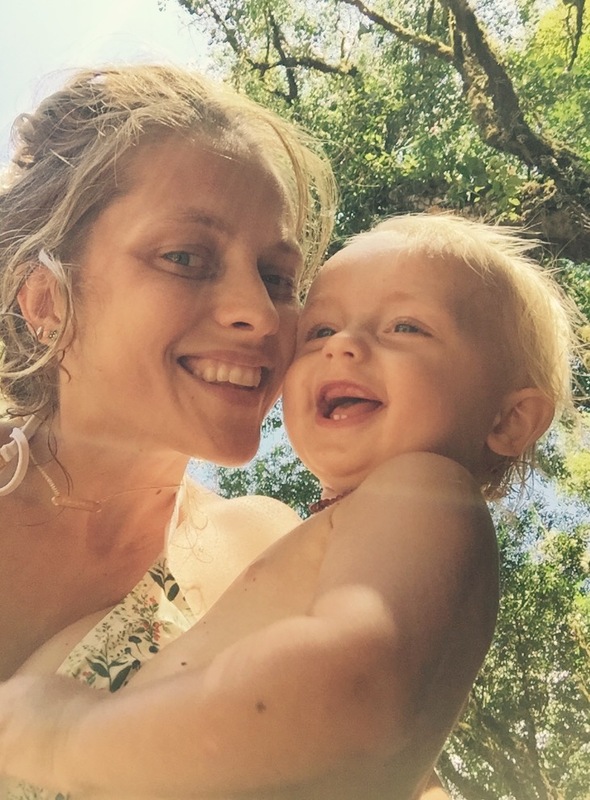 I knew that I wanted to start this work before I became a mother because I knew that when I became a parent that my world would significantly shift and all the glorious spare time I had would look radically different. I got pregnant with Bodhi about a year into my quest to go deeper. Throughout my pregnancy with him I utilized moments to read some of my favorite spiritual teachings and developed a pretty unwavering respect for all that I was- the beautiful imperfection of me. I could start to clearly see patterns in my past behavior, link personal habits to various life experiences during my childhood, and start to unravel the self imposed pressure that had lay on my shoulders for so many years: The pressure to succeed, the pressure to be attractive enough, the pressure to be smart, the pressure to conform, the pressure to stay relevant. I could see how much these things had a hold of me and I knew that with the impending birth of my son that it was a beautiful time to start peeling away these layers and become really open and raw. The pregnancy healed so much of this lacking of self worth, I think the combination of being able to feel my healthy son growing in my belly and watching my body change rapidly was liberating. The sense of giving over to the experience of pregnancy instead of trying to control every moment was beautifully rewarding. I had previously been wrapped up in an I-must-control-everything vortex as a direct result of being told that I needed to get in better shape, get more sleep, clean up my diet, be on point in auditions, be more refined, work with a dialect coach, work on my speech, attend this event, connect with this important person or that important person even when I didn’t particularly like a persons energy! SO much pressure and I naturally buckled underneath it! Day in and day out I focused so hard to meet others expectations of me, I was an unhappy shell of myself. I was so lacking in self love that I let this noise reach me and affect me, creating negative eating and exercise patterns, causing a fixation on auditions, blaming myself for not being good enough, pretty enough, educated enough, and drawing comparisons between myself and others careers. It was a toxic cycle and I needed to break free. I took 3 months off in 2011 to just sit and reflect on my life and where it was headed and I suddenly had so much clarity. I think letting go of all of the self imposed (and externally imposed) stress in my life helped create the space for me to meet a likeminded person in the form of my husband Mark. Together we connected over our passion surrounding self development work, spiritual teachings and we became each other’s mirrors, cheering each other along our own journeys. We still do daily check ins with each other and have a wonderful dynamic of being able to regulate each other emotionally and spiritually when needed. Meanwhile releasing myself from those restraints and coming in to a healthier place with all aspects of my life has allowed room for such wonderful things to come into my life; Bodhi, this new little baby, plus such positive online communities such as Your Zen Life and Your Zen Mama. My career has also very naturally opened up in a way I have always dreamt of. I equate all of that to letting go and just being happy being me. We live in a world where people are so quick to judge us, judge our way of life, our interests, our passions, our decisions, the way we parent, judge our children and their behavior, what kind of birth we have/want, whether or not we breastfeed or for how long, how many children we have, if we have children, do we work or stay at home raising kids? Co-sleep or cry it out, screen time or no screen time, the list goes on. There are so many people who are dealing with their own insecurity or lack of true acceptance of themselves who will want to lash out and try to tear you down, because even on a subconscious level misery loves company and they can find moments of comfort in that. In this world the reality is that there is so much separatism already that it’s on us to celebrate what connects us, what empowers us and each other, how can we make our lives more enriched, and enrich other lives around us. How we can love and accept and support ourselves first and foremost, build up that self worth, cultivate the self value because you, just as you are right now, you’re enough. Then, you can spread that goodness far and wide.